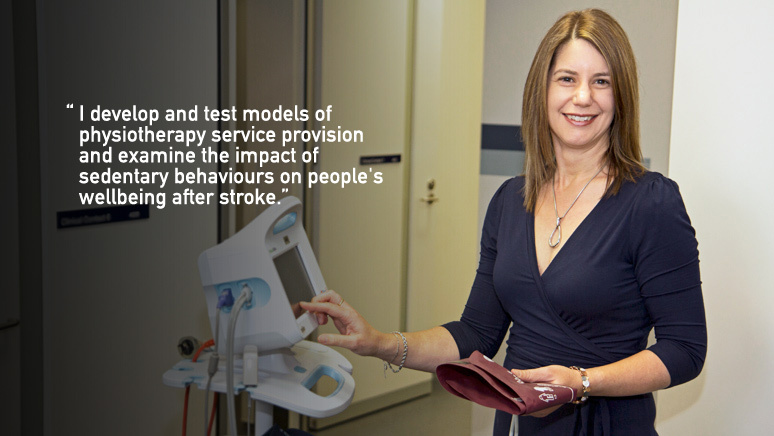 Passionate and pioneering, Associate Professor Coralie English is focused on helping stroke survivors to regain their ability to walk and staying healthy in the long term. There's a lot to be said for small things making a big difference. Associate Professor Coralie English's research in the health sciences arena is no exception – a single, literal step for one stroke patient equals a 'giant leap forward' for collective rehabilitation and brain recovery efforts across the country. "My work is divided into two streams," the energetic academic shares. "I develop and test models of physiotherapy service provision and examine the impact of sedentary behaviours on people's wellbeing after stroke." "The latter is intertwined with a lack of activity, particularly in hospital settings, and a need to practise tasks regularly to get better at walking and everyday jobs." Realising that exercise is "especially important" for long-term survivorship, Coralie is similarly determined to create "better, detailed and nuanced guidelines" for those who can't do what is currently recommended. "We're all supposed to exercise for 30 minutes 5 times a week, but most of us don't," she clarifies. "Achieving this is even harder if you have a disability or suffer from fatigue and depression, which are common conditions after stroke." "I want to figure out how much physical activity is necessary to see some health benefits." "Will we see improvements if patients sit a bit less and move a little more often?" Coralie's research career began in 2000, when she undertook a PhD at the University of South Australia. Though previously enjoying "making a difference" by "helping people get back on their feet" as a physiotherapist working in local rehabilitation centres, she soon found that life as a clinical physiotherapist raised more questions than it satisfactorily answered. "Standard practice back then was to have a single, one-on-one physiotherapy session each day," she explains. "But I often wondered whether having physiotherapy offered in groups would be more beneficial for stroke survivors." "So I decided to compare the two delivery methods." An innovative initiative, Coralie's study eventually became pilot data for a multi-centre randomised control trial. Completed in 2014, the larger project sought to determine the pros – if any – of conducting therapy sessions individually, in groups and on weekends. "Our feeling was that providing a little bit extra on weekends might not be as effective as providing a lot more therapy, but in groups such as circuit classes, throughout the working week," she recalls. "We were able to dramatically increase the amount of time patients spent with a physio when therapy was provided in group circuit classes." "It didn't matter in terms of their degree of recovery of walking, however." "This is partially because they didn't spend extra time practising walking or being on their feet outside of these sessions." Coming in with one question and spawning "a million" others, Coralie confesses she didn't quite get the answer she was hoping for. "We still don't know what factors drive how much activity people are able to do in hospital," she acknowledges. "But it's vital we identify and address them." Coralie stayed on at the University of South Australia after receiving her doctorate in 2006, opting to renew her academic appointment and build creative collaborations with the influential Florey Institute of Neuroscience and Mental Health in Melbourne. A master at multitasking, the stroke recovery researcher also took on a Postdoctoral Training Fellowship with the National Health and Medical Research Council (NHMRC) in 2010. Under the guidance of one of her greatest mentors, Professor Julie Bernhardt, her postdoctoral work focused on understanding sedentary behavior of stroke survivors. "We did a big systematic review, an observational study and a randomised control trial to see whether we could encourage stroke survivors to "sit less and move more," Coralie asserts. "Ready to move" and work with different people almost a decade later, Coralie joined the University of Newcastle in July 2015. The Associate Professor is newly and contentedly affiliated with some of the Hunter's most accomplished, internationally renowned minds in stroke recovery research. "The region also boasts an NHMRC Centre for Research Excellence in Stroke Rehabilitation and Brain Recovery, held in conjunction with the Florey Institute in Melbourne," she comments. Hitting the ground running, Coralie is already preparing for a number of exciting research ventures. The biggest, and perhaps most impressive, will see the prolific publisher lead a laboratory-based study on sedentary behaviour in stroke survivors in early 2016. Funded by a National Stroke Foundation Seeding Grant, the ambitious trial will seek to break up prolonged sitting times and encourage small but significant increases in light physical activity. "Participants will come in and sit for six hours straight," she explains. "We'll measure their blood pressure every hour and take regular blood samples to investigate reductions in cardiovascular risk markers." "Then they'll come back again and do the same thing, only this time they'll get up and go for a short walk every half an hour for 3 minutes." "The final visit will involve the participants doing some simple standing manoeuvres, such as squats and knee lifts every half an hour." Replicating similar works conducted by the prestigious Baker IDI Heart and Diabetes Institute, Coralie is simultaneously looking to shift the focus onto wider disease prevention and treatment. "Researchers there have already shown that even short bursts of exercise can have huge benefits where glucose and insulin metabolism and cognitive function are concerned," she reveals. "We're expecting the results to be even greater for our group as they're starting off at a worse health status than those who were used in the original experiment." Hoping to use data collected to "leverage" larger amounts of financial support in the months and years to come, Coralie admits it "would be really good" to expand the project to look at different types of activity breaks for different types of stroke survivors. "It's definitely a goal of mine," she affirms. "I'd like to eventually be able to say that if you can't walk independently, if you can at least stand up x amount every x minutes, you will be healthier and reduce your risk of having another stroke." An educator dedicated to honing her craft, Coralie is also working with a University Postdoctoral Fellow on developing a national longitudinal study of recovery of walking after stroke. "There's very little contemporary information and Australian-specific information about this," she discloses. "So we're aiming to engage clinicians from around the country and collect a core dataset." Extending her network even further, Coralie is simultaneously developing several national and international collaborations. What began as informal meetings at a coffee shop during a stroke conference in 2014 has since rapidly evolved into an ACTIOnS group, for example, with the social scholar and 16 others joining forces to harmonise outcome measures and refine research strategies in stroke recovery. "I'm part of a subgroup of the World Stroke Organisation too," she declares. "I love finding the best people to work with to answer a given question."